SYDNEY—Australia’s largest community of Tibetan refugees is based in a beach town in Sydney. In their new home far from the Himalayas, hundreds of Tibetans are learning to swim. It’s an important safety skill for those living near the ocean – as well as a way to adapt to Australian culture. Waves crash on the beach in Dee Why, an idyllic seaside town about 40 minutes north of Sydney. It is early evening but surfers and swimmers still dot the waters of the Pacific Ocean. A large swimming pool fed by seawater juts out from one end of the beach. Dozens of people swim, splash and play here, including adults and children from Tibet. Dee Why is home to nearly 20,000 people, including more than 800 Tibetans who make up Australia’s largest Tibetan community. Tibetan refugees are settling in to their new home with help from English and vocational classes funded by the Australian government. Far from the snow-capped mountains of their homeland, they are also learning to swim. Nearly 300 Tibetan adults and children in Dee Why have learned to swim through a program started in 2012 through a local non-profit calledWater Skills for Life. The next swim course for Tibetans starts this month. Pasang Tsering, a 40-year-old Tibetan who emigrated from India to Australia in 2008, sits near the pool that commands a sweeping ocean view. There are no lifeguards at this public pool. 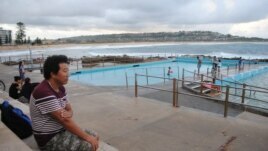 Like most Tibetans in Dee Why, he had never seen the ocean before arriving in Australia. But he learned to swim through Water Skills for Life, which also supports swim programs in Vietnam. Tsering passed exams to become a certified swim instructor so now he assists in the Tibetan swim program. Pasang Tsering had never seen the ocean before emigrating to Australia. Now he teaches swimming to Tibetans in Sydney. “Most Tibetans don’t know swimming so I hope [to] teach more Tibetan kids and adult. We live near the ocean, so dangerous for life, so we should learn,” he said. 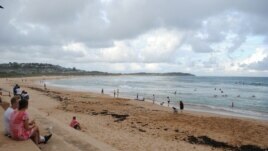 The beach is an integral part of Australian culture and recreation. Children typically learn to swim at a young age. But to non-swimmers and those unfamiliar with risks such as rip currents and sharks, the powerful ocean can be life-threatening. In 2013-14, 266 peopledrowned in Australia. Tanya Carmont, an Australian swim teacher and president of Water Skills for Life, recalled first teaching Tibetans to swim in Dee Why. She said many Tibetans who arrive in Dee Why aren’t familiar with the ocean or with the risks of water, which can be a dangerous trait. The Tibetan program includes a 10-week swim course that costs just $15 because it is subsidized by local grants. It also includes a general water safety training that educates people about ocean currents, what to do in an emergency, the basics of CPR and more. A booklet on water safety illustrated with photos has been translated into Tibetan for people in the swim program as well as Tibetan students in local public schools. Translation is no easy task since there aren’t words in the Tibetan language for “rip current”, CPR and other terms. Several years ago Carmont noticed several Tibetan students in the regular swim classes she teaches at community pools in the area. She learned that there was a sizeable community of Tibetans in Dee Why and that they were eager to learn to swim. Carmont developed the program with the Manly Community Center, a local social services office. The Australian government each year accepts a certain number of Tibetan refugees living in exile in India, where the Dalai Lama fled in 1959 after China took over Tibet. In Australia today, there are about 1,200 Tibetans and their numbers are growing. Learning to swim is an important safety skill. It also helps Tibetans integrate into Australian culture. Phurbu Khonnyi Tsang, the president of the Tibetan community in the state of New South Wales, lives in Dee Why. As a community leader, he helps Tibetans adjust to life in Australia. “Tibet and Australia [are] two different countries. Tibet is dry land mountains, snowy mountains, there’s no beach and ocean. We have only rivers and lakes. So when you come to Australia all the boundaries are beaches. It is very important to learn swimming and basic important things – swimming, their language, their culture,” said Tsang. Carmont said Tibetan refugees learning to swim shows “they’ve really embraced the Australian way.” Their enthusiasm reflects openness to adapting to their new home in Australia – and they’re jumping in feet first.